LOUISVILLE, Miss. (WCBI)- We’ve introduced you to Quinn Gregory, a 7-year old boy who is battling a rare disease. While spreading awareness about his illness, the Winston County boy caught the attention of a Mississippi State athlete. 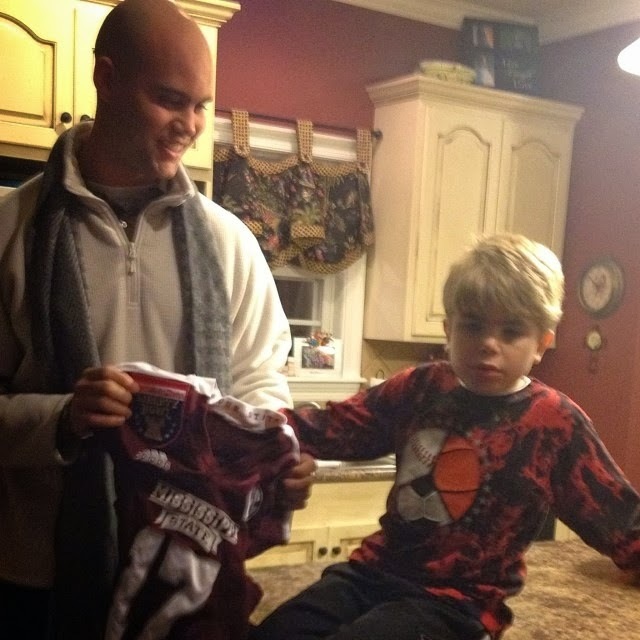 The seven year old got the surprise of his life when starting quarterback Tyler Russell gave him a jersey, the day after winning the Liberty Bowl. “That just really shows more about Tyler’s character than anything and what great guy he is. He could be out doing whatever on that day and he chose to come see us,” says Suzanne Gregory. Five years ago, doctors told Brad and Suzanne Gregory their son Quinn had a rare and incurable disease. “MPS 3A; which is called Sanfilippo Bone Syndrome. His body is missing an enzyme. Mainly affects his brain. His brain deteriorates and he will eventually not be able to eat not walk and just get to vegetable state,” says Gregory. The Louisville family is bringing attention to Quinn’s disease by handing out bracelets to everyone they meet, including Russell. “We were out at a local restaurant here in Louisville and we were just eating supper. He walked in and I ran over and gave him a bracelet and we took pictures with him and the kids,” says Gregory. The meeting left an impact on the Gregory family and Russell. “So I was home and my ten year old called from the ballgame and she was like, momma, Tyler has his bracelet on and so I started rewinding back to look at when he would throw the ball because he would wear it with his throwing hand,” says Gregory. “Exciting for him to wear my brother’s bracelet,” says Brayleigh Gregory. Suzanne says there are hard days. However, small moments of selfless caring keep her motivated. “God will carry you through it because He has definitely carried us through this whole time and then we have moments where Tyler Russell walks into our house and gives us a jersey so we have moments like that,” says Gregory. Thanks for coming to my house,” says Gregory. The Gregory family says Quinn is the only person they know of in Mississippi with the rare illness. Quinn is a student at Fair Elementary School.